The simplest of cards can sometimes be the most powerful. The cost of this card is sky high because if it were any lower it could easily be abused by Cald as was proven during playtesting. Even with this cost, it can still be abused by Cald, but not very easily. The name of the card suggests the ability - Creatures that are snowed in can't attach each other. This card doesn't attach or target a specific magi though, so it lasts for a whole 3 turns before the effect wears off. A powerful card indeed. 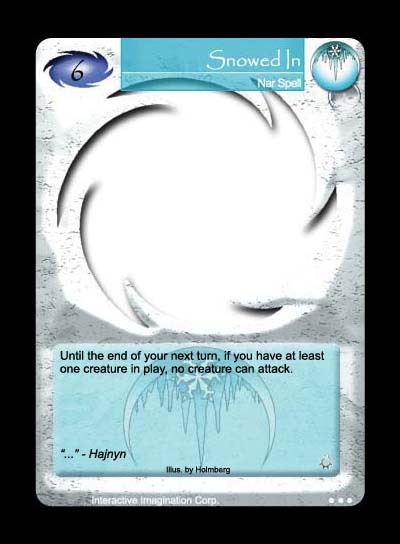 The art is one of the easiest to do in the set, being that it's blank and all. Credit goes to Holmberg just out of homage to him.